Working with schools at an education facility in South Wales. 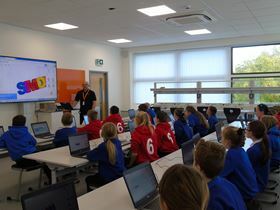 Additive manufacturing (AM) company Renishaw has launched a new part of its website aimed at parents, teachers and school students in South Gloucestershire, Bristol and South Wales. The pages include engineering careers information, an online booking form and engineering careers ‘mythbusting'. Renishaw says that it works with local schools, universities and partners to promote a positive view of engineering careers to young people and offers a range of activities including practical sessions, work experience, careers talks and tours of its facilities. The new web pages offer an online booking form for schools in South Wales, Bristol and Gloucestershire to attend Renishaw for a range of workshops. Engineering and IT services company Infosys and Renishaw have joined forces to promote the volume production of end-use metal components.